This article describes you the step by step procedure to setup Apache HTTP Web server on RHEL7 / CentOS7. 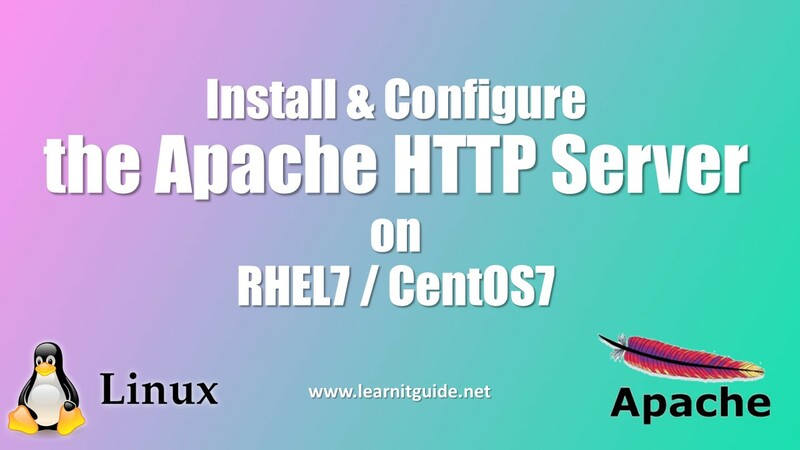 Use the following instructions to install and configure the Apache HTTP Web Server on RHEL7 / CentOS7. Install the appropriate Apache Web server package "httpd" using yum to avoid dependencies issue. Refer this link to configure the Yum Repo Server - Configure YUM Repo Server on Linux. 2. Start and enable the httpd service to start when the system boots. 3. Allow httpd service on firewall for incoming connection or disable the firewall. By default, port 80 is blocked. It should be enabled, because default http service will listen on port 80. so we need to change the firewall rules to enable http port or you can disable the firewall completely. Once the firewall rules are set or disabled completely, Open the browser from client machine where our server is reachable and enter the URL http://node1.learnitguide.net. Replace "node1.learnitguide.net" with your server name. now you could see the test message from the web server as "Testing 123...This page is used to test the proper operation of the Apache HTTP server". If you get the test output, our web service is running properly. Note : Make an entry of web server domain name in DNS to resolve the address node1.learnitguide.net or www.learnitguide.net to the IP Address. Refer this link to Install and configure the DNS Server on RHEL7 / CentOS7 or make an entry in local hosts file. Ignore if you prefer to use the Web server IP Address 192.168.2.102 directly. Lets create a web content. 4. Create a Web content for our website to display the Webpages. Create a index.html under web server's default parent directory /var/www/html. Testing purpose, I have used the simple text content in the homepage file index.html as "Welcome to Homepage of Learnitguide.net Test Web server", You can create your own content or host the webpage content shared by the web designers. We will explain you how to setup multiple websites on single node with different directories for each websites. Execute any below commands to test the configuration files for errors. if you get warning as above output, you can ignore or just make an entry of 'ServerName' directive in the configuration file /etc/httpd/conf/httpd.conf to suppress this warning. Once again, open the browser from client machine and enter the URL http://node1.learnitguide.net. you could see the content which we have set now as "Welcome to Homepage of Learnitguide.net Test Web server". That's all about installation and configuration of basic Linux Apache Web server on Linux.